U.S. Custom and Border Protection agents with full riot gear take part in a drill to protect the crossing gates against people who want to cross the border illegally on the international bridge between Mexico and the U.S., in Ciudad Juarez, Mexico, Oct. 29, 2018. The Pentagon is deploying 5,200 troops along the U.S. border with Mexico to help agents deal with a caravan of Honduran migrants heading to the United States. "Border security is national security," Gen. Terrence O'Shaughnessy, head of U.S. Northern Command, told reporters Monday. He said the 5,200 soldiers will be in addition to the nearly 2,100 National Guard personnel already along the border. Customs and Border Protection Commissioner Kevin McAleenan said about 3,500 men, women and children in Mexico are slowly making their way to the U.S. 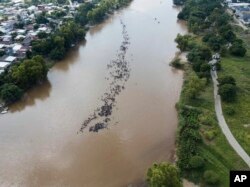 Some of the migrants crossed the river into Mexico despite police efforts to keep them from entering the country as one large group. A new group of Central American migrants bound for the U.S border wade in mass across the Suchiate River, that connects Guatemala and Mexico, in Tecun Uman, Guatemala, Oct. 29, 2018. McAleenan said those who manage to make it into the U.S. will be apprehended and their asylum requests considered, as required by U.S. law. He said border agents will act with the highest respect for the law and treat people as humanely as possible. But McAleenan said there is no benefit in trying to get in as part of a large group, especially in what he calls an "illegal and unsafe" manner. He said U.S. immigration courts are facing a huge backlog of asylum requests and reminded those in the caravan that they already have generous protections in Mexico, including the promise of work visas and the chance to apply for refugee status. McAleenan said 1,900 asylum seekers are picked up at U.S. border crossings a day, and that many of them put themselves in the hands of violent smugglers. President Donald Trump put it more bluntly in a tweet Monday. In an interview Monday with Fox News, Trump said the U.S. would construct "tent cities" for asylum-seekers. "We're going to put tents up all over the place," Trump told Fox News' Laura Ingraham. "They're going to be very nice and they're going to wait and if they don't get asylum, they get out." A group of men part of a caravan of thousands of migrants from Central America en route to the U.S, pull down the border gate with the intention to carry on their journey, in Tecun Uman, Guatemala, Oct. 28, 2018. Again, without providing evidence, he said there are "many gang members and some very bad people mixed into the caravan." The president also claims "Middle Easterners" are in the group. The first group of migrants left San Pedro Sula, Honduras, earlier in October. Honduras is one of the world's most violent and deadliest nations, in part, because of gangs and drugs. Many of those trying to get to the United States want to escape the daily threat to their lives and the lack of jobs, and want to get their children away from the influence of gangs. News reports quote unnamed U.S. officials as saying the White House is weighing a range of administrative and legal actions on grounds of national security to restrict the ability of migrants to seek asylum. Although no decision has reportedly been made, immigration attorneys told VOA the move would be quickly challenged in court. The U.N. refugee agency is urging Washington to allow people fleeing persecution and violence to request asylum on U.S. territory. “Our position globally is that the individuals who are fleeing persecution and violence need to be given access to territory and protection, including refugee status and determination procedure," UNHCR spokesman Andrej Mahecic told VOA. "And if the people who are fleeing persecution and violence enter Mexico, they need to be provided access to the Mexican asylum system, and those entering the United States need to be provided access to the American asylum system,” he said.